The Abrams Planetarium Sky Calendar promotes skywatching for people of all ages. As its name implies, the sheet for each month takes the form of a calendar. Diagrams in the boxes invite the reader to track the moon's rapid motion past the planets and bright stars of the zodiac, as well as to follow the more leisurely pace of the planets in their gatherings with bright stars and other planets. 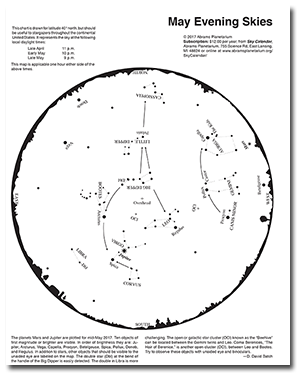 The reverse side consists of a simplified star map of the month's evening sky. The sky maps are designed for use at a convenient time in mid-evening, for a latitude useful for the entire continental U.S. (40 degrees north). The Sky Calendar has evolved into one of the nation's most highly illustrated, easy-to-follow guide to sky events. Not only is it enjoyed by thousands of paid subscribers, but it is used (with permission) by classroom teachers with their students, by planetariums and astronomy clubs, and by park interpreters for audiences at sky talks. Both the sky map (on the reverse side) and the calendar have appeared in issues of Science and Children, a journal of the National Science Teachers Association. The Sky Calendar has received awards for excellence in educational journalism from the Educational Press Association of America. It has since had favorable reviews not only from astronomical publications, such as Sky & Telescope and Mercury, but also from School Library Journal and Scientific American. In his review column in the latter, Phillip Morrison determined it to be "a bargain entry into direct observation of the the changing order visible in the heavens." In an annual summary of astronomy publishing (in Mercury magazine), the Astronomical Society of the Pacific gave its Special Commendation to the Sky Calendar. Astronomer George Lovi, in his Ramblings column for Sky & Telescope, called it "one of the most approachable, understandable, and friendly observing guides ever offered." 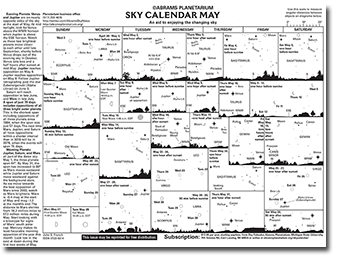 The Sky Calendar is published in loose-leaf form and mailed quarterly (Feb-Mar-Apr; May-Jun-Jul; Aug-Sep-Oct; Nov-Dec-Jan). A subscription may start anytime and consists of twelve issues. Gift subscriptions are welcome and recipients are sent a notification card.